The PA president recently announced that Palestinians want all the Jerusalem and West Bank territory captured in 1967; al-Aqsa rioters have ‘right to defend themselves'; and he slammed Hamas for ‘destroying’ unity. And he insists: "We won’t let Israeli extremists ‘contaminate’ Temple Mount" and warned of global ‘religious war. Israeli extremists aren't supposed to "contaminate the Temple Mount"? Really? Methinks the guy has it backwards: The last time we checked, GOD gave Israel to HIS people (who are referred to as "Jews" - see the Torah!). Yeah, sure, His people were scattered into the nations, but "the world" returned Israel to them in 1948 after the Holocaust (thus making two Bible prophecies come true in one day, just as Jeremiah prophesied). So not only YHWH Himself but also "the world" admitted Israel was a nation that belonged to "the Jews"; not to the squatters who had allowed the Land to become a barren DESERT, who are calling themselves “Palestinians”!!! This also means the Temple Mount NEVER belonged to the Muslims – EVER! Muslims have always been terrorists, starting with their patriarch, Ishmael - whom YHWH referred to as an uncontrollable "wild donkey of a man. Genesis 16: 11 The angel of the LORD also said to her: "You are now with child and you will have a son. You shall name him Ishmael, for the LORD has heard of your misery. 12 He will be a wild donkey of a man; his hand will be against everyone and everyone's hand against him, and he will live in hostility toward all his brothers." Jews are the only people in the world who are continuously forced to justify to others their existence as a nation and spiritual entity and to prove their land rights on Israel. The world HATES "the Jews" - and most don't even know why! Well, here is the reason; here is the crux of it all: The Tribe of Judah was chosen to take Torah into the world and safeguard and preserve it (Genesis 49:10, Micah 4:2). And then, of course, "hate groups" like to add that "the Jews killed Jesus"...What these lukewarm "Bible experts" DON'T know is that "we all killed Jesus"! Yes, "the Jews" initiated it on that fateful day; but who was it that spat on Him, pulled out hanks of His beard, flogged Him AND crucified Him? The Gentiles! The thing is, He HAD to die to become our "Savior"....If He had chosen not to, we would still be forced to kill innocent animals to atone for our sins! Romans 11:11-12: "But I say: Have they so stumbled as to fall entirely? May it never be! Rather, by their stumbling, life has come to the Gentiles for (awakening) their jealousy. And if their stumbling was riches to the world, and their condemnation riches to the Gentiles; how much more their completeness?" Zecheriah 12: 9 And it shall come to pass in that day, that I will seek to destroy all the nations that come against Jerusalem. 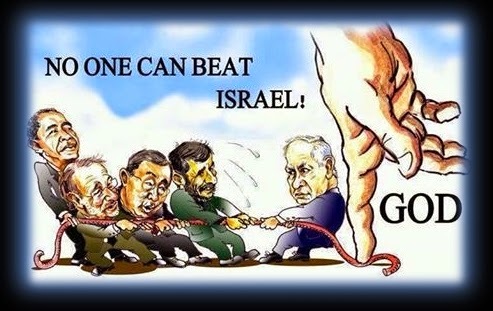 Genesis 49: 10 The scepter will not pass from Y'hudah, nor the ruler's staff from between his legs, until he comes to whom [obedience] belongs; and it is he whom the peoples will obey. Micah 4: 2 Many Gentiles will go and say, "Come, let's go up to the mountain of ADONAI, to the house of the God of Ya'akov (Judah's father)! He will teach us about his ways, and we will walk in his paths." For out of Tziyon will go forth Torah, the word of ADONAI from Yerushalayim. NOTHING says that the Land EVER belonged to the “Palestinians!” The Palestinians have proven themselves to be nothing more than TERRORISTS who seek war at every turn. They don’t just want the Temple Mount (which has NEVER been theirs!!! ); they want ALL Israel, and they want “the Jews” DEAD. Too bad for them, because the very people they are in the process of trying to wipe from the face of the earth are HIS people! Jeremiah 31:35-37: This is what the LORD says, he who appoints the sun to shine by day, who decrees the moon and stars to shine by night, who stirs up the sea so that its waves roar- the LORD Almighty is his name: "Only if these decrees vanish from my sight," declares the LORD, "will the descendants of Israel ever cease to be a nation before me." This is what the LORD says: "Only if the heavens above can be measured and the foundations of the earth below be searched out will I reject all the descendants of Israel because of all they have done," declares the LORD. Romans 11:25-27: "I do not want you to be ignorant of this mystery, brothers, so that you may not be conceited: Israel has experienced a hardening in part until the full number of the Gentiles has come in. And so all Israel will be saved, as it is written: "The deliverer will come from Zion; he will turn godlessness away from Jacob. And this is my covenant with them when I take away their sins." Thanks for YOUR post, too, Anonymous! YHWH has always been with His people. He has kept His promises. Unfortunately, "the world" can't seem to recognize this, and that is why the "end times prophecies" are unfolding very rapidly now. Things are happening - and the ONLY thing people can really do is to get themselves "right" spiritually. Nothing else matters. To me this is a sign of Y'shua's Return. He will put an end to His enemies when He comes back. I am excited cause I know the end of the story. Amein to that, CrowMedicineWoman! Thanks for your post!